Jordan Eberle, by virtue of his work with Hockey Canada, was a famous player before he’d so much as skated a shift in Edmonton. He’s evolved into a pretty good offensive winger and a key piece of the Oilers’ rebuild. How many goals will he score next season? For those interested in a brief explanation of this series, see the first post in it (on Taylor Hall). 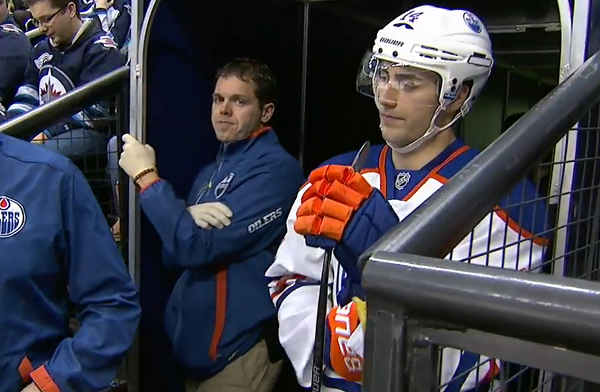 Eberle has missed 19 games to injury over the course of his NHL career, and only six over the last three seasons. Given his elusiveness and the style of game he plays, I’d be comfortable penciling him in for his three-year average of two games lost to injury. As with Hall, Eberle playing for the Oilers last year makes it pretty easy to project his minutes, too. That includes significant time at even-strength (15.82 per game) and on the power play (3.03 per game) as well as some time on the penalty kill (41 seconds per game). The first two we can project forward without hesitation, and Eberle on the PK is a recurring experiment so we may as well chalk him up for about the same usage. As with Hall, we should note again the surprising drop-off in performance for Eberle last season at even-strength. Again, this is something I’d chalk up to poor work by the Oilers’ coaches, with the expectation that they manage to correct it in 2014-15. At even-strength, we’ve projected Eberle to play a little more than 1,260 minutes next season. Using our estimated shots/hour rate, that works out to 176 shots. Eberle’s been a pretty good shooter over his NHL career, averaging 13.1 percent at even-strength, so some simple math gives us a projection of 23 goals at even-strength. On the power play, we’ve projected Eberle to play just over 240 minutes next season. Using our estimated shots/hour rate, that works out to 46 shots. Eberle has shot at a 16.1 percent clip on 137 power play shots over his career; given that his power play shooting percentage is only slightly higher than his even-strength number I lean towards believing that it’s a reasonable estimate of his true talent. That equates to 7 goals on the power play, and as he’s scored three shorthanded goals over the two seasons he’s been used while down a man I’m also going to add 1 goal on the penalty kill. Our eight comparables averaged 22 goals from their most-used wingers last season (keeping in mind that we’re ranking these players by ice-time per game, rather than total goal production). Eberle’s projected 31 goals put him well clear of the pack; the only player ahead of him on this list is Patrick Sharp. I’d like to see Ebs play more like a guy who’s been in the league for 4 years already and claim some territory on the ice. To me he kinda carries a ‘rookie’ vibe with him which pussifies his play. I’m a fan and all and glad he’s an Oiler but I think he’s the complimentary player of the big 3 and not a driver. But that’s a role. Maybe some improved coaching will help this out, god knows he didn’t get any last year. I agree with that completely that he’s not a driver right now, which to me puts him as like you said a complimentary player rather than a core player. The Oilers don’t have the luxury of complimentary players right now, they are still looking for the core guys. I like Ebs and all but if he doesn’t solidify himself as a nightly team driver/leader, I think he needs to be traded for that core piece in a more important position. Such as 1-2C or a 1-2 Dman. It’s much more important to have those pieces in place than a complimentary top 6 winger. Does the #3 winger get their story posted three times, etc? The Oil rarely had games like you describe last year. Goal scoring was a problem. They finished bottom 5 league wide in for goals for. Remember all the shutouts? Getting the puck out of there own end/net is a big reason they didn’t score but lets not pretend they were filling the nets up. Maybe not that exact score every time , but he didn’t give us a chance . , then the confidence was gone and we got blown out . That’s my take and I’m sticking to it . I agree that many games last year they had trouble getting puck out of their end. When ever they played a team that aggressively forchecked giving the Oilers no time, they would turn the puck over or bounce it off the boards hoping to regain it in the neutral zone. This greatly impacted the goals against versus goals for. Hopefully, the breakout (when under pressure) is an area that the coaches and players can improve on this year. If so, then their results will improve as well. Yes they were terrible at getting the puck out of their own zone. But that also had a lot to do with terrible coaching, as it was very predictable that the defence would ALWAYS move the puck along the wall and the opposition was always waiting there for the puck. The coaches need to learn to mix the break outs up so they are not so easily predictable. Better coaching will do wonders for how much better this team will be. I just don’t think that Eakins and Acton are the right people. But I sure hope that Ramsey can get through to Eakins and get him to set aside his arrogance, and be willing to admit when he is wrong and something isn’t working and the change to a new strategy. But unfortunately I don’t think that Eakins will ever admit to him being wrong at anything. They may be worse offensively this year too. Better hope Perron didn’t have a career year, Yak doesn’t have another year like last year and that the Big 3 show they can start carrying a team to some wins as it is year 5 for 2 of them. Mactavish hired a rookie, AHL coach to coach the SWARM in the NHL and then he didn’t acquire a capable back up to an unproven starting goaltending, whom he publicly questioned before this season began. Well the goalie mess was forced upon him and MacT did address the issue before the end of the season. I have a hard time being convinced that MacT hasn’t improved this lineup and after the reign of error, I think we may finally have a product that can compete every night. Yes the roster still has some holes but the holes aren’t nearly as glaring as the pre-MacT era. Eberle pumps up to point a game man once again after an off season . 80-100 points projected . I know we are going to see a drop off for Nuge as well from last year when article 3 comes out. Willis it is a good thing you didn’t post these articles near the end of the season or the calls for Eakins head would have been worse. Every time you write something along the lines of “…the coaches will manage to correct for next year…” I cringe. Is it safe to assume that the forwards coach this year will be Acton and that he was the forwards coach last year as well? If we land another top 1-2 Center some of Hall , Hopkins and Eberle stats might start to soar . Example : We latch onto O,Reilly or similar . We should have two dynamic lines then rather than just the one line of the three of them . Would be nice if Draisaitl is that person this year . I wasn’t really an Eberle fan last year, I think he took a page out of Gagner’s book and started to mail it in a few too many times just because he’s on a weak team. If there’s anything to take out of Gagner’s book it’s that, that attitude is career suicide. I guess overall that’s a testament to Eberle’s skill and game when he can come across as not fully delivering, and still put up 28 goals and finish top 30 in NHL scoring. With those stats you can’t really pick the guy apart too much besides say it looks like he’s still got more left on the table, which is a compliment to him and good news for Oiler fans. Eberle’s production is dependent on being on the Hall, RNH line. If he doesn’t spend the whole season with that duo his production will drop. My projection for Eberle 2014/15: 29 goals 37 assists. Learn how to one time it kid!